The clean lines and traditional farmhouse style of the Vault apron-front sink integrate seamlessly in a variety of kitchen spaces. Handcrafted from durable stainless steel, this double-bowl sink features tightly angled corners to maximize basin space, and a top-mount design for easy installation and use on most laminate countertops. Vault's ultra-flat rim makes it easy to wipe from the counter directly into the sink. With integral shortened self-trimming apron. Your kitchen will resemble a full renovation with this meticulously handcrafted stainless steel sink. The sink is sculptured to be top mounted and will fit over most dishwashers and other cabinets. The premade faucet hole allows precise installation with a beautiful and polished finish. The twin sized bowls are carefully laid out to maximize appearance and function. This Ancona Top Mount Double Bowl sink uses the most of your valuable space while maintaining a stylish appearance for your countertop. The dual-bowl design offers versatile functionality making kitchen clean-up a breeze. Its sleek design complements any dicor style, and the option of top or under-mount installation allows for easy integration into your dream kitchen design. This kitchen sink includes two vanishing-edge strainers. It will modernize your kitchen area and give your entire kitchen a contemporary look. Vault Top Mount Stainless Steel 35.75X24.313X9.313 1-Hole Double Bowl Kitchen Sink The clean lines and traditional farmhouse style of the Vault apron-front sink integrate seamlessly in a variety of kitchen spaces. Handcrafted from durable stainless steel, this double-bowl sink features tightly angled corners to maximize basin space, and a top-mount design for easy installation and use on most laminate countertops. Vault's ultra-flat rim makes it easy to wipe from the counter directly into the sink. 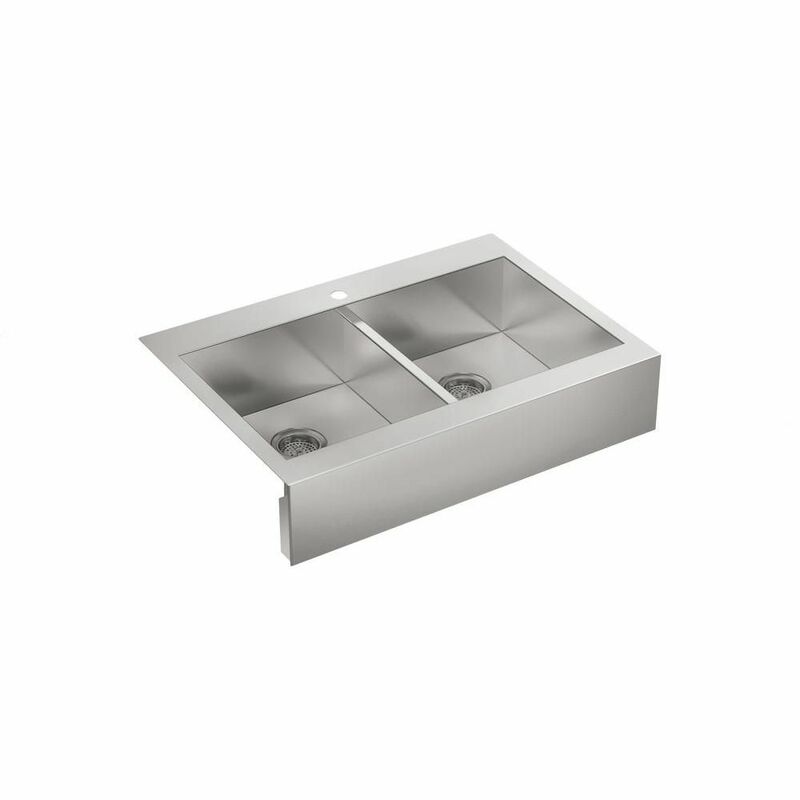 Vault Top Mount Stainless Steel 35.75X24.313X9.313 1-Hole Double Bowl Kitchen Sink is rated 2.8 out of 5 by 15. Rated 4 out of 5 by Mark from I needed a drop-in apron sink to use with a... I needed a drop-in apron sink to use with a granite countertop that I got a bargain on but was cracked at the sinkhole. This was the only apron drop-in I could find. I was hesitant to buy it based on negative reviews but am glad I did. I do wish the bowls were more rounded so it was easier to rinse. Rated 5 out of 5 by HomeDepotCustomer from Looks great, I haven’t installed sink yet, waiting for new... Looks great, I haven’t installed sink yet, waiting for new cabinet still. Rated 4 out of 5 by MP from I finally got around installing my KOHLER Vault Drop-In Stainless Steel (Silver) 36 in. 1-Hole Do... I finally got around installing my KOHLER Vault Drop-In Stainless Steel (Silver) 36 in. 1-Hole Double Basin Kitchen Sink that I ordered and picked up at HD two months ago (the first sink they shipped was damaged and bent at the rim). The double bowls are big and spacious and perfect to set large over-sized saute pans in along with the dishes to soak overnight if you don't feel like using the dishwasher. I would have given this sink 5 stars but gave it four stars, why? I have two complaints: #1) The Kohler Tech Designer obviously never stepped one foot in a kitchen and/or isn't familiar w/current updated Building Codes regarding plumbing...why? This sink DOESN'T come with TWO pre-drilled holes - it only comes with ONE or THREE or FOUR holes. It doesn't come with TWO HOLES, one for the faucet and ONE for the DISHWASHER AIR GAP normally situated on the right side of the faucet hole. I had to buy a drill bit specially designed for boring a hole in stainless steel - and it was a pain. The other complaint is... #2) Shame on you Mr. Kohler for not including wire racks or at least one rack for the bottom to prevent scratching! Kohler charges around 50 bucks just for one wire rack (and good luck trying to find a cheaper generic rack that will fit in the Vault's odd interior dual bowl size) and it doesn't come with a new shiny sink strainer with a new circular sink rim, tssk tssk! Other than that, it's nice and spacious and to be honest - large oversized kitchen sinks in the 36 inch wide size range are very limited and available on the market within this price category. Rated 1 out of 5 by Rozalynn from Sick was damaged and had a big dent on lip... Sick was damaged and had a big dent on lip of sink. Now I have to return at store and waiting on another sink which setback my contractor two weeks. Very disappointed. Great looking sink though! Rated 3 out of 5 by ArrivedDamaged from Beautiful sink but it came with 2 dimples in the... Beautiful sink but it came with 2 dimples in the skirt. Product arrived damaged. Rated 2 out of 5 by Kae33 from The product is very pretty from a distance. When up... The product is very pretty from a distance. When up close every welded spot shows through. This is not a big issue on the back of the sink where the faucet goes. It is quite an eye sore on the apron though. Rated 1 out of 5 by Bummed from The workmanship and quality on this sink was a profound disappointment. This sink does live up to... The workmanship and quality on this sink was a profound disappointment. This sink does live up to the Kohler name. Unless the Kohler name now means cheap substandard garbage built outside of the U.S. Do not purchase this sink. You will be wasting your time with the return trip to home depot for your refund!